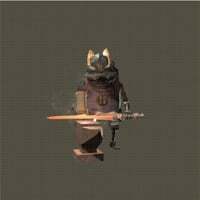 Masamune is an NPC in Nier: Automata. "A blacksmith in the forest kingdom. His teacher was a master craftsman, known for improving the 8 legendary weapons of Virtue and Cruelty. He separated himself from the network due to an internal malfunction, so he is no longer hostile towards androids. He loves weapons more than anything, and as proof of your respect for weapons, he grants you the weapon his teacher honed." Sells the Machine Sword, Machine Axe and Machine Spear. You'll find him in the Forest Zone, just before the Royal Chamber access point. When you reach the side scrolling portion of the castle keep going until you come to the second Linked-Sphere Type. Past it is a jump. Aim for the lower platform. In the leftmost corner you will hear banging. Move the large crate and head into the room to find him. Gives you the weapon Cruel Lament if you speak to him after upgrading a weapon to Level 4. To get his unit data, you must have all machine weapons already purchased or purchased through him and upgrade a weapon to level 4. Broken link on the page. Someone musta been on the fallout 76 wiki at the same time as this page... "Weapons" links to "Fallout+76+Weapons" lol. i cant get A2 to pull back the crate? i assume hes not available to her on 3rd playthrough? For those of you confused about how to get in, you can apparantly drag the box backwards. It took me about half an hour to figure this out. That crate really pisses me off.